Publisher Raw Fury and developer Long Hat House have come together to give us quite the indie game. 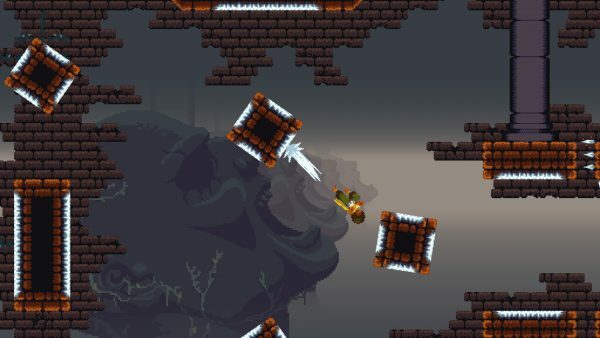 Dandara is a Metroidvania style game with focus on exploration and 2D action-adventure gameplay and while this may seem a bit commonplace and trendy, Dandara caught my attention in a big way with its concept, character development and world building. Originally released for the iphone in December of last year, this metroidvania inspired game makes the leap on to the Nintendo Switch. Dandara’s concept is loosely based on the story of an Afro-Brazilian warrior who fought aside men against slavery during the colonial period of Brazil’s history. This makes sense considering the developers are from that country and considering such little known this tale may be in North America, a game is an excellent medium to spread what is known about her story and inspire others to try and learn about this little known historical figure. 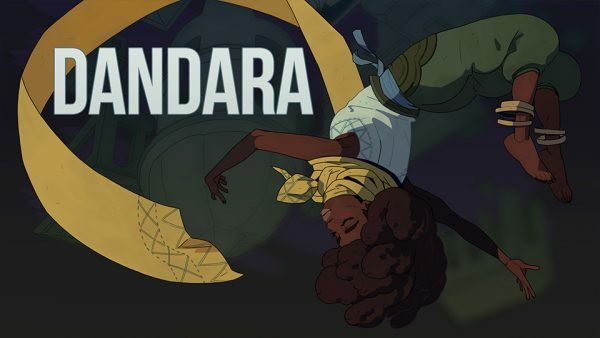 Even though the game is abstract, Dandara as a character definitely displays the strength and cunning of a true heroic warrior and her interactions with the characters definitely help build her legend throughout the game. 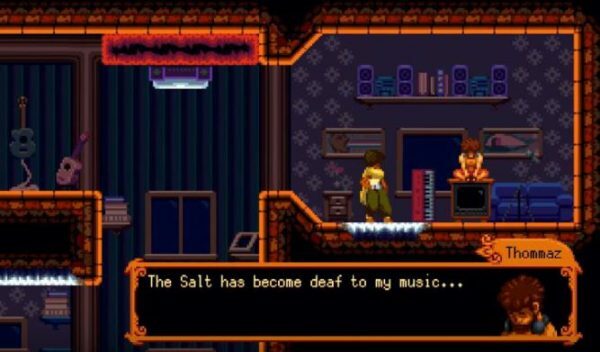 The game takes a more futuristic dystopian atmosphere with fantastical elements to this warrior’s story than relying on a historical period for its setting.. You are Dandara, and it is up to you to explore this world of Salt and to save it from the brink of destruction. Along the way you will come across beautifully colorful and equally as beautiful dark areas of this nearly ruined world to find items, currency and characters that can help you on your mission. The way you explore this world is through a series of platform jumping, dodging attacks and landing strikes and the right moment – critical skills for most games in its genre. Throughout the world there are these areas you can jump to by bending gravity as well. 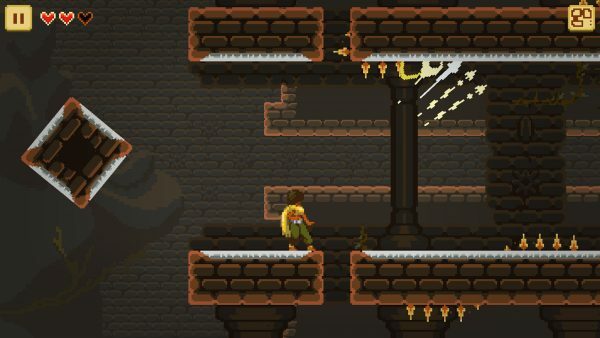 Dandara will seem to blink to your target as you continue working your way around the world, finding new ways to unlock areas and finding ever more powerful enemies to conquer. Combat is also fairly straight forward. Dandara has a gun that she can aim at enemies. Much like the platforming, you aim and press a button or tap the screen to where you want the shot to hit. Since this game is made for both touch screens and console games, it can make the controls a little funny when compared to its contemporaries that only have one style of control. There were times I felt the aiming was slightly difficult to maneuver, especially trying to make my way around corners or through tight areas with the analog sticks of the Switch joy-con. I also found combat to be a bit frustrating as aiming and shooting can sometimes be a bit slow and therefore you have to be more methodical with your shots – planning them out with precision. Perhaps that was the point the developers were going through though. 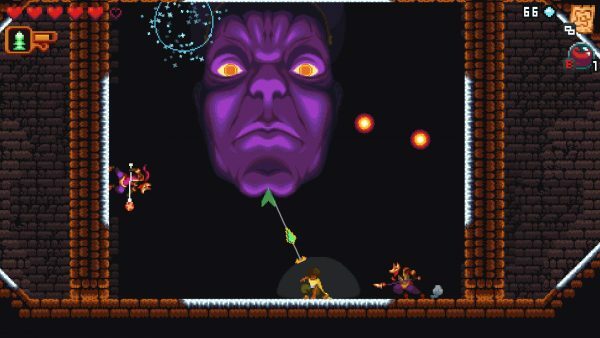 This game is less of a run and gun, rapid paced adventure and more of a strategic platformer. You need to plot out where you want to go to best avoid being hit by enemies, the timing of your jumps and learn the movement pattern of the enemies before aiming so you can hit them accurately. 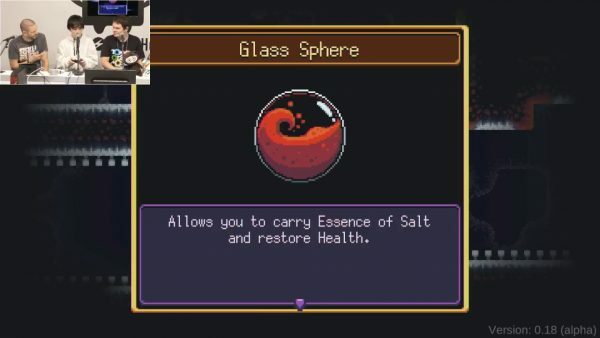 You can also improve your longevity and gameplay by obtaining the games currency, called salt, and using it to increase your health or weapon effectiveness. This game may get frustrating at times, but its unique concept and beautiful pixel art make it all worth it to explore and experience this game. It is also notable to add that this game has a beautiful soundtrack to accompany it which really makes the experience all the more rich. Overall, I found this game deeply enthralling and unique. For the price of $15 USD for the Switch version of the game, I would say it is definitely worth supporting this developer and see what they will come up with next. I learned something about Brazilian history and got a beautiful experience thanks to Long Hat House. The gaming industry needs more like this when the market is flooded by asset flippers and loot box abuse. We need to get back to passion and fun and creators who simply want to create art, tell a story or just make a fun game.